It’s not even halfway through 2018 and the buzz around artificial intelligence (AI) is bigger than ever. It seems we’re finally starting to get past the overblown fear about a robot-dominated future, but the fear has been replaced by a lot of hype. AI is now being thrown around as a buzzword in every part of our lives. If everything is AI, what exactly is AI anyway? Like many others – including IBM – we think “augmented intelligence” is a better way to describe what we do with our AI platform. Primal’s augmented intelligence applications help people do their jobs better, serve individuals’ interests, and bring AI to its full potential. 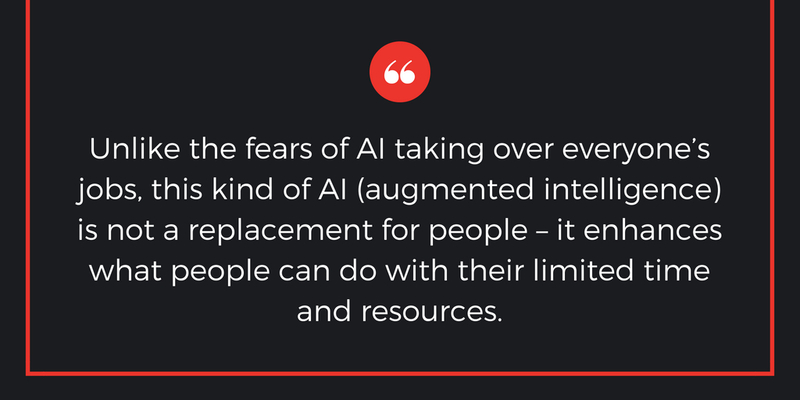 Unlike the fears of AI taking over everyone’s jobs, this kind of AI (augmented intelligence) is not a replacement for people – it enhances what people can do with their limited time and resources. The nail gun didn’t displace the carpenter, but carpenters sure are happy they have nail guns. One of the use cases of Primal’s AI platform is an augmented intelligence application that can determine the meaning of content in order to find other content which is highly related. Primal does this much like a real human brain by using semantic synthesis (where semantics refers to the meaning of words, and to synthesize is to combining several things into a coherent whole). Primal’s AI breaks textual objects such as an article, a post, a tweet, etc. down to an ‘atomic’ level. As an overly simplified example, “firetruck” becomes “fire” + “truck” and finds meaning by analyzing how this combination of words has been used across millions of online sources. It then synthesizes the meaning of each word (semantics) to determine the message being expressed in the original content. In our firetruck example, the word “fire” could be related to wood, burning, and emergency, but also camping, coziness, and marshmallows. Only some of these words would be used in the same context as “truck”. Combining the words “fire” and “truck” together would net more relevant results such as burning, emergency, rescue, fire fighter, arson, etc. Again, this example used the simple term “firetruck”, but Primal has the ability to analyze and synthesize the meaning of a larger piece of content such as an entire news article. Once Primal has analyzed the message of the content in this way, it can find and recommend other content that has the same meaning – not just similar keywords. All of this happens on-the-fly in real time, with each request to Primal creating a new set of potential connections and recommendations. Unlike big-data AI solutions which require lots of training data, Primal can find meaning from very small pieces of data, like a tweet. Because it doesn’t rely on specialized databases, Primal’s technology can be used in a variety of different industries and use cases. If you’re a social media manager, you know that curating and selecting relevant content to share on social channels is time-consuming, and it’s hard to break through the noise to get noticed by your target audience. Primal’s augmented intelligence tools for social media can send individualized content to each person who follows you – not just random content, but highly relevant articles that fit in the overlap between their interests and those of your brand. Articles could be from third-party sources or from your own content library – enabling greater usage of created content. When your followers receive an article just for them, it stimulates much greater interaction than when they read a generic post sent to your whole channel. Often it sparks a conversation, providing an opportunity to connect in new ways and build brand loyalty. They’re more likely to share the content further, which extends the reach of the original post and ultimately results in new organic followers for you. And all of this can happen automatically, freeing up your time and enabling you to connect to many more people. Primal isn’t just for recommending articles or other content – it can also analyze product descriptions. When you run an online store, the product recommendations your customers see are usually based on what other customers bought. But it takes a lot of user data to teach the system to make meaningful recommendations. If you’re not Amazon and you don’t have millions of customers, how do you get enough data to populate your recommendation database? With Primal’s augmented intelligence, you don’t need lots of data – Primal can analyze the original product description to determine meaning and recommend other highly relevant, complementary products. These are just a few use cases where augmented intelligence can help you better engage with your customers, provide extra value, and increase your productivity. How could this work for you? Let us know by dropping a line to hello@primal.com.